I've spent some time lately doing 2 things that I love : having coffee time @ Starbucks & coloring . There has been much buzz lately about the benefits of coloring.. The New York Times recently had a great article on the subject. I am sure that many of my creative friends, like me, knew this all along... Not new to us !! I spend many hours with my stamped images and something to color with. Unity Stamp Company's Wondrous image was my latest project during coffee time... 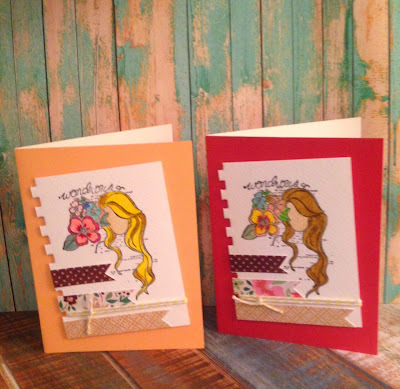 I used my Tim Holtz Distress Markers , Stampin' Up markers & my fun glittery atyou Spica pens to color the image.. The image was popped up on the card with dimensionals. I made banners from Basic Grey Herbs & Honey paper and wrapped some Maya Road Saffron Yellow twine cording to finish it.. 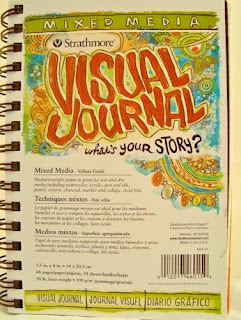 I stamped the image in my very favorite Strathmore Visual Journal. The 3.5 x 5 size fits in my purse and it always has stamped images in it ready to be colored !! I just wish that your starbucks was closer to Iowa so I could meet up with you there and we could color to our hearts content. Your colors on your girls is so vibrant and cheerful. I hope you have a blessed day today my friend!! ML...... THAT would be an amazing day !!! Thanks !!! These "girls" were such fun to color !! Thanks so much !!!! Me too----can't wait for that day either !! Love your cards Debra!! And also know what you mean about loving that precious "coffee time". As far as my favorite coloring medium it would probably have to be a tie between using Distress & Pitt markers or Prismacolor pencils. I use them both about the same depending on my mood. Thanks for the opportunity!! Both cards are amazingly beautiful! Oh my, I can see myself sitting in Starbucks (I'm a coffee-holic!) coloring in a little journal. I love to color with pencils that I have had forever. And I would be thrilled to win a journal from you (I have been thinking about doing this anyway!). I'm new to all of this and just adore your blog! My favorite markers are my Faber Castels!! Thank you so much, Kathie.... My blog is almost a year old and I am so glad you have come to visit ... Love anything Faber Castell too !! Love those too, Galina !! Glad that you finally got to comment... Thank you so much for the lovely comment..
Watercolorist at heart but have started working more with cppics and markers although I often find rough sketches to be more charming and a bigger personality. I love my Koi watercolors Pocket Field Sketch box--take it everywhere ! Thank you for visiting my blog !! Thank you so much --glad you like it !! Great cards. I have been playing with watercolours lately. Still learning. Ruby, me too !! I have a KOI watercolor set that I love and can easily come with me when I am going out... Thanks so much --this stamp is the best..
Great cards and I have a visual journal too! Love it! 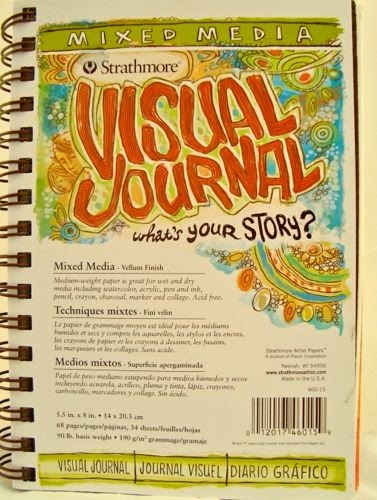 the visual journal would be fun. A great way to practice and to keep a record of the stamps you have. I usually color with Copics. I just found the Chameleons and I've colored a little with them. they seem to be wonderful but I need more practice. I don't use colored pencils - don't know why. I've done a little watercolor but need to do more. This journal will be a great way to try out and improve on all of those techniques. thanks. Sounds like a perfect day girl! These are pretty. Great coloring. Your cards are wonderful. Great FWF project. Thanks for sharing. My fav is my Copic pens but I just got some Chameleon pens to play with and so far I like them, too. I like your coloring and the banners. I like to color with alcohol markers and when I have more time I use my colored pencils. I have been experimenting with watercolors. Love the lovely image and banners! I love starbuck too. So glad you are able to combine you loves to create such beautiful things.